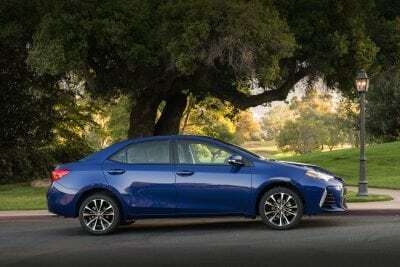 The Toyota Corolla has been a mainstay in the compact sedan market for years. It’s aim has been to provide a roomy interior through a utilitarian nature amid a reputation for reliability. 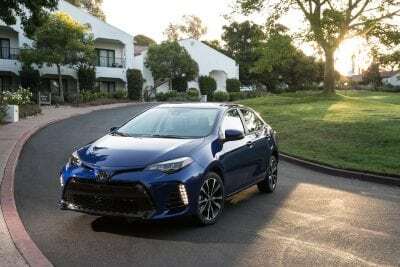 The 2018 model largely succeeds in those aims, but there is some very stiff competition in the compact markets these days and the Corolla now hopes to mark itself apart with superior safety as well. The Corolla has been around for decades, using the same formula since the beginning to find success. It’s compact, low in cost to own and operate, and roomy for a small car. 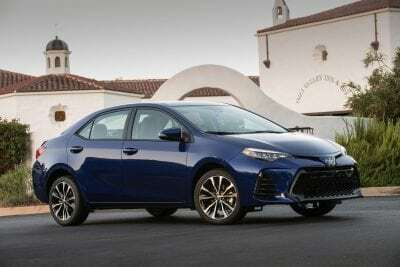 The 2018 Toyota Corolla carries over largely unchanged from the big additions made for 2017, which included some advanced safety equipment that’s offered as standard. That equipment, which includes forward collision warning and pre-collision system, pedestrian detection, and automatic emergency braking. Adaptive cruise control is also standard in the Corolla. Most of the competition in the compact market either does not offer these systems at all or only offers them on the most expensive models. The 2018 Toyota Corolla comes in six trim levels, not including the iM Hatchback, with front-wheel drive. L – Comes standard with 15-inch steel wheels, LED headlights and daytime running lights, tilt-telescoping steering adjustment, a driver information display, 60/40 split-fold rear seating, a 6.1-inch touchscreen with Bluetooth and 6-speaker audio, a USB port, and Siri Eyes Free voice control. Standard safety systems are outlined above and also include automatic high-beams and lane departure warning with steering assist. LE – Upgrades to 16-inch steel wheels, heated side mirrors, variable wipers, door lock/unlock remote, added interior accents, better upholstery, automatic climate control, and a rear seat armrest (folds from the center seat back). 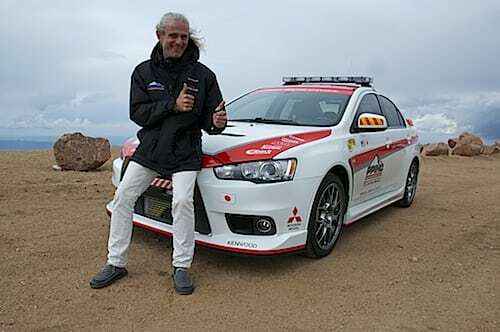 LE Eco – Adds to the standard LE with the engine upgrade, suspension changes, downgrandes to 15-inch steel wheels, adds a rear spoiler and enhance aerodynamics upgrades, and improves fuel economy by 2 mpg in the city and 2 mpg on the highway. SE – Is the sport package for the Corolla. Starting with the LE’s features, the SE upgrades to 17-inch alloy wheels, unique front fascia styling, a rear spoiler, paddle shifting in CVT-equipped models, a sport-style gauge cluster, upgraded head lamps, bumper-mounted LED running lights, and a leather-wrapped steering wheel. A 6-speed manual transmission becomes an option and nixes the paddle shifters, but adds a sunroof and keyless ignition as well as the XLE’s infotainment upgrades. 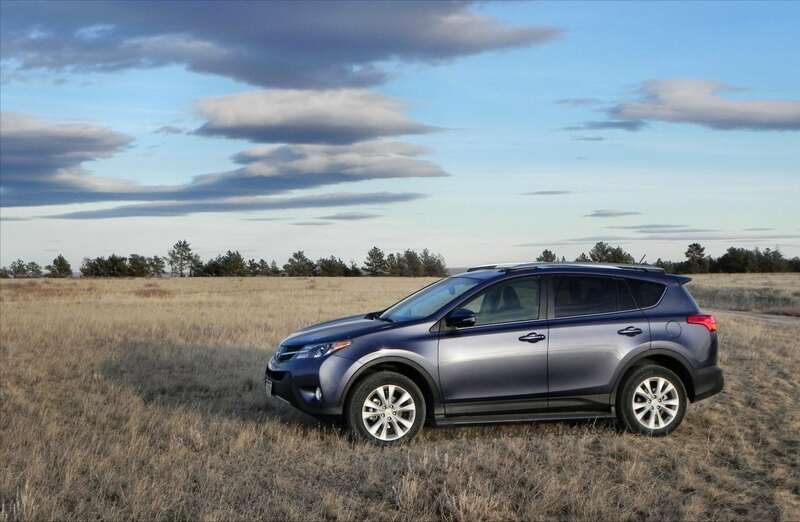 XSE – Includes the extra features for the SE’s manual transmission option, but keeps the paddle shifters and CVT. Adds the power-adjustable driver’s seat and SofTex simulated leather upholstery. XLE – Adds to the LE model with 16-inch alloy wheel, better headlamps, LED tail lamps, bumper-mounted daytime running LEDs, keyless entry and ignition, a sunroof, simulated leather upholstery, power-adjusting driver’s seat, heated front seating, leather-wrapped steering, and an upgraded driver information display. Infotainment is upgraded to a 7-inch touchscreen with satellite radio, Scout GPS Link navigation app, and Toyota’s Entune App suite. The 2018 Corolla is a smart-looking car when compared to most in the compact segment. It’s aggressive without being off-putting or cheap. 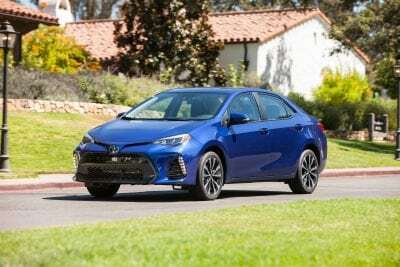 The segment has slowly been learning that stand-out looks are a boon to sales and Toyota was quick to capitalize on that trend with this new-generation Corolla. Inside the 2018 Toyota Corolla is a roomy, fairly well-done interior with a good layout. Getting into and out of the Corolla is easy thanks to wide-opening doors and low step-in height. That’s true of all four doors, in fact, which is sometimes a problem with compact cars. The front seats are comfortable and adjustable while the rear seating is good for two adults or three kids or a mixture thereof. Legroom in the rear is a bit cramped sometimes, but that’s true of any car in this segment. 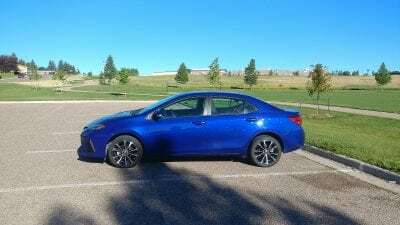 Materials quality in the 2018 Corolla is pretty good, though some cheap-feeling plastics are still found occasionally. 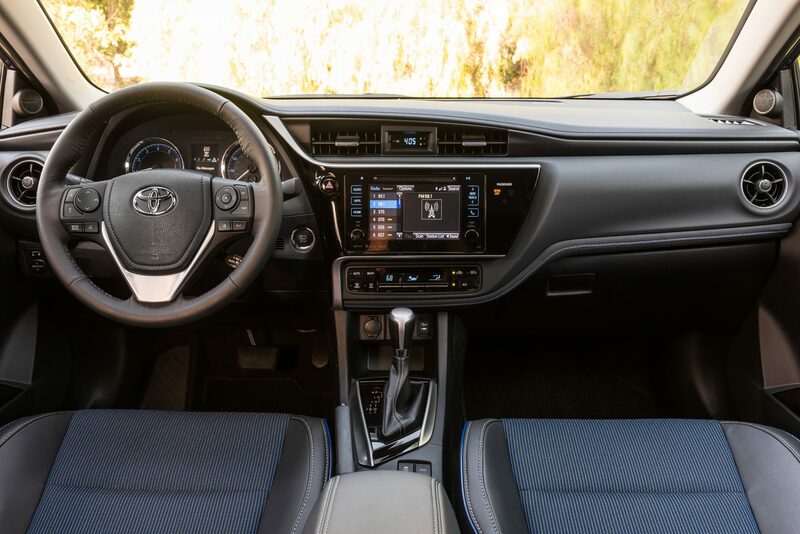 Interior elements like useful storage and upscale design are missing in the Corolla, but no more so than with competing options. We like the road noise improvements made to the 2018 Corolla’s interior, though, which is a good benchmark for the segment. Trunk space in the 2018 Toyota Corolla is good, at 13 cubic feet with a wide loading area. Some have larger trunks, but less clearance for items, we note, and are glad for the taller space found in this Toyota. The rear seats fold down in all Corolla models, but do not drop flat. 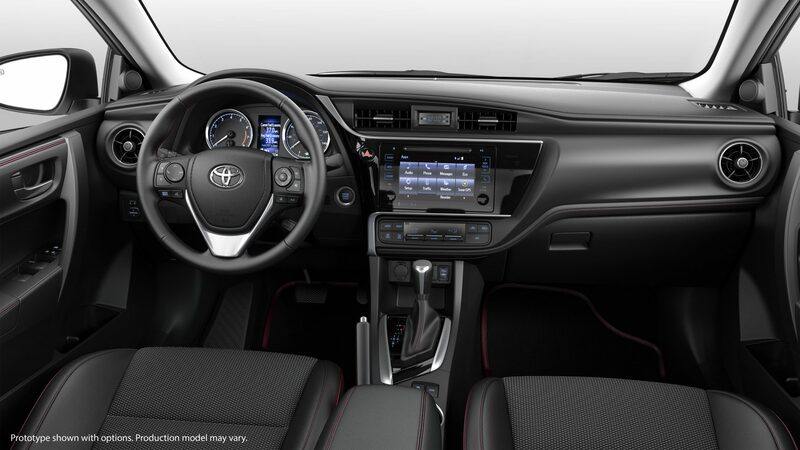 We are not fans of the infotainment found in the Corolla at all. 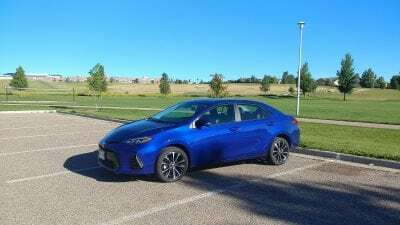 The Entune system is outdated, slow, often clunky to use, and just not very well done in the 2018 Corolla. Toyota’s proprietary app is not a substitute for Apple CarPlay or Android Auto, though it tries to be. 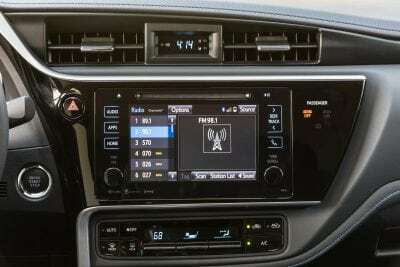 Finally, the touchscreen in the Corolla is too small, even with the upgrade. All but one Corolla model are now powered by a 1.8-liter four-cylinder engine that outputs 132 horsepower. This engine is attached to either a six-speed manual transmission (SE model Corolla only) or a continuously variable transmission (CVT). This engine/transmission combination does little to motivate the Corolla with anything more than bare essential aplomb. Acceleration and around-town feel are good enough to get around, but confidence is not generally high. On the highway, the Corolla is sluggish at best. Fuel economy is the car’s primary goal. That fuel economy is good, though, at 28 mpg in the city and 36 mpg on the highway (31 mpg overall in the real world, we found). The Eco model produces about 8 more horsepower, but you won’t feel it as it’s largely lost in the MPG orientation of that model, which adds 2 mpg each to the city and highway numbers. Competition in the compact sedan segment is getting more fierce. The Honda Civic is one of the best-sellers there and it is more fun to drive with similar qualities to the Corolla’s upsides, but with a slightly higher price tag as well. We really like the new Kia Rio, which has upped the bar for the segment with a great drive quality, upscale interior, and Kia’s well-regarded, industry-best warranty. The Mazda Mazda3 is another great option with good all-around design. High Reliability, which is always good, is what the Corolla is most well-known for. Great MPG returns both on paper and in the real world. Safety goes above and beyond with advanced options not found in the segment normally. Interior is not as good as some rivals offer. Infotainment is below par compared to just about everybody else. Lagging performance that brings little to nothing to the table. The 2018 Toyota Corolla offers a good mixture of looks and economy for the compact segment. Many buyers are drawn by the Corolla’s high reliability expectation and solid safety scoring. We wouldn’t blame them at all. The 2018 Corolla was a manufacturer’s press loan for about a week. During that time, about 200 miles were put on the car in mixed driving conditions with varied passenger loads. Weather was not inclement.